What started off as a hobby, has turned into a great love and devotion to the Macedonian wine culture and tradition. 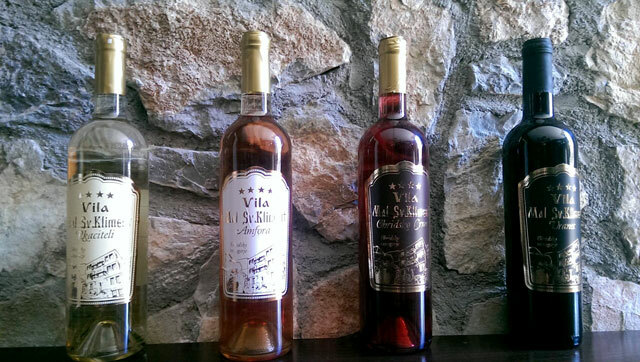 As a small family managed winery, Vila and Winery Mal Sveti Kliment is dedicated to producing only the finest wines, made with great care, passion and the finest grapes! Our boutique winery produces only a couple thousand bottles each year. All the vineyards are located in the Ohrid region, a few kilometers from the city, near the lake and by the mountainside. The vineyards are small, traditional farmlands, managed by the family and by local agriculturists from the nearby villages. Every grape we use is handpicked when it is perfectly ripe, which ensures the quality of our wines. Due to the proximity of the vineyards to the lake, the unique climate of Lake Ohrid is very much reflected in the taste of our wines. This is particularly evident in Ohridsko Crno and Pamid varieties, which are native to these regions. We take great pride in our award-winning wines and our focus is exclusively on high quality and tradition. Our wine bar is built in a traditional stone style, where we even produce our Amphora wine by an ancient method. We invite you to further explore our wines and traditions with us, with exclusive wine tastings at Vila and Winery Mal Sveti Kliment. Please contact us to reserve your wine tasting, dinner, corporate events and wine tasting groups.